Why didn't Vader arrive at the second Death Star in the Super Star Destroyer Executor instead of some smaller Star Destroyer when meeting with Moff Jerjerrod? Is there any Legends or canon explanation for this? Vader arrives on a bog-standard Star Destroyer because the Emperor is using The Executor as his own command ship. He arrives on it a few days later, presumably having taken time out to visit a spa, do some tourist things and just generally chillax before getting down to the nitty-gritty of inspiring abject terror in his Death Star workforce. The Super Star Destroyer rested in space above the half-completed Death Star battle station and its green neighbor, Endor. The Destroyer was a massive ship, attended by numerous smaller warships of various kinds, which hovered or darted around the great mother ship like children of different ages and temperaments: medium range fleet cruisers, bulky cargo vessels, TIE fighter escorts. When he entered the docking bay, thousands of Imperial troops snapped to attention with a momentous clap. The shuttle came to rest on the pod. Its ramp lowered like a dragon’s jaw, and the Emperor’s royal guard ran down, red robes flapping, as if they were licks of flame shooting out of the mouth to herald the angry roar. They poised themselves at watchful guard in two lethal rows beside the ramp. Silence filled the great hall. At the top of the ramp, the Emperor appeared. 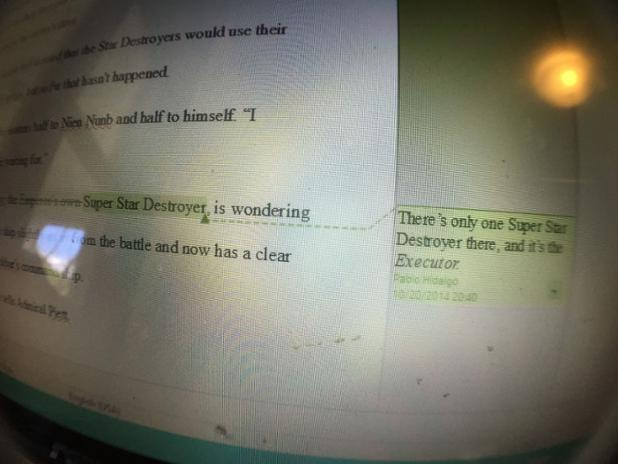 Pablo Hidalgo of the Lucasfilm Story Group has confirmed that there was only one Super Star Destroyer present at the Battle of Endor (that being The Executor). This is also confirmed in the (canon) short story The Levers of Power in which a battlefield display shows the ships in orbit of Endor to include The Executor. Sloane could see the arrowheads of other Star Destroyers to either side of her, and farther down the line the shining bulk of the Executor, the massive dreadnought that served as flagship of the task force. That being said, a couple of more recent novels (including the new Junior novelisation of RotJ and Aftermath: Life Debt both identify the Emperor's arriving ship as the Eclipse. No explanation is given for this canon discrepancy. Why did Palpatine and Vader go to the Death Star? Why is the crashed Star Destroyer mostly intact on Jakku? Why are the standard Star Destroyers white?